A newspaper article, originally posted by The Associated Press, published in The Miami Herald on March 2, 1962. According to the article, a fragment of the Atlas rocket used for John Glenn's mission was found on a farm in South Africa. South African officials made plans to return the artifact to the Smithsonian Institution in Washington, D.C. Original newspaper article: "Glenn's Rocket Found in Africa." The Miami Herald, March 2, 1962: Private Collection of Dr. Calvin D. Fowler. 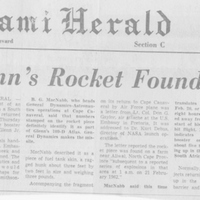 Digital reproduction of original newspaper article: "Glenn's Rocket Found in Africa." The Miami Herald, March 2, 1962. Originally republished by The Associated Press and republished by The Miami Herald. Copyright to this resource is held by The Associated Pressr and is provided here by RICHES of Central Florida for educational purposes only. Swenson, Loyd S., Charles C. Alexander, and James M. Grimwood. This New Ocean: A History of Project Mercury. Washington, D.C.: National Aeronautics and Space Administration, 1966. The Associated Press. “Glenn's Rocket Found in Africa.” RICHES of Central Florida accessed April 25, 2019, https://richesmi.cah.ucf.edu/omeka/items/show/6415.